The site of concern occupied part of the former Inchgreen Gas works. The plot is adjoining the Southern banks of the Clyde estuary sandwiched between the Kingston Yard site and the Inchgreen Dock. The site is irregular shaped (relatively flat) parcel of land of about 0.8ha in area. The gasworks were established on the island of Inchgreen in October 1873 and by 1896 the plant included three in ground tank gasholders and gas manufacturing facilitates. A forth gasholder was constructed between 1913 and 1920 to the North West of the site. The general principle of the overall remediation works was to address contamination issues associated with the sites history. The main contaminants of concern were identified as arsenic, cadmium, nickel, lead, Total Petroleum Hydrocarbons (TPH), Polycyclic Aromatic Hydrocarbons (PAH) and cyanide. The proposed end use for the site is to be a combined private residential housing and flatted accommodation. 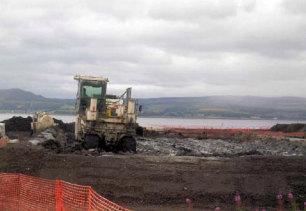 The potential receptors to the contamination identified on site include the adjacent River Clyde, major Aquifer and associated groundwater and site workers during construction phase & end users once the site has been redeveloped. The outline proposal was to enable maximum re-use of material on site. Envirotreat were considered preferential on the basis of its advanced stabilisation capabilities and overall cost. It was estimated that a ‘dig & dump’ option would have cost approximately £1.5 million, whereas Envirotreat were able to stabilise most of the contaminated material onsite for £700,000. The strategy involved the ex-situ stabilisation of approximately 9,500m³ of contaminated soils. The EClay specifically designed for this was a modified reactive inorgano-organoclay, primarily focusing on the effective treatment of the contaminants of concern. With the addition of cementitious materials the physical properties of the treated material are improved and play an important role in the curing process. The objective to produce a chemically and physically stabilised treated mass for deposition as a substitute for imported material. The strategy involved producing 150m³ treatment pads of contaminated soils. These pads were sprayed with EClay slurry (by means of a slurry spreader), prior to mixing with a Wirtgen which also incorporated the addition of the cement at the same time. Surface and perched groundwater contamination issues were addressed by carbon treatment prior to discharge into the Clyde.